What a great weekend. A lot of my Basic Training crew from the Athletic Club signed up for the Clyde’s 10 K run. A friend I run with said she would run with me. I signed up because Karen & I both said we would walk/run the course. After I signed up Karen told me she couldn’t do it, which made my anxiety level rise to an 8 on a scale of 1 to 10. But then, my friend and co-worker Jen said she would stay with me the whole race and would walk with me when we needed too. Whew! The night before the race, I played 9 holes of golf with 2 friends and we walked the course. What was I thinking the night before my first 10K and I’m walking 9 holes?! But it was loads of fun – all 3 miles and 50 or 60 swings of the clubs. It’s been awhile since I played but we had a great time. When I got home I crawled straight into bed. I slept pretty well, then woke up early to make an energy shake and have a hard-boiled egg. I got downtown and couldn’t find my crew but I did run into another friend who hugged me and encouraged me. I finally found everyone and we walked down to the lakefront. We took some photos and talked and pumped each other up. The race started and Jen and I took off. I had not walked the course and had no idea what the route was. Lots of hills. The first mile was hard, but then we settled into a nice pace. The first hill was hard and we walked a little bit and took off again. It was nice having everyone along the route cheering us on. 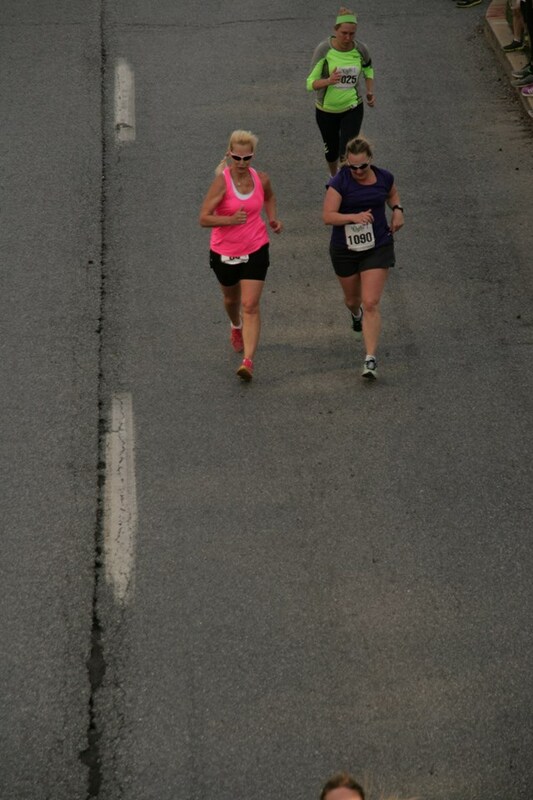 When we got to mile 4 Jen kept encouraging me and pushing me on. She was great. We walked some, ran a lot. Jen kept telling me 10 football fields to go, I was like what?!!!! That seemed like forever to me. We finally made it to the last hill and we were looking at the finish line. My crew who had finished before us were waiting at the finish line cheering us on. That was great to see all of them cheering! I’m a 10 year cancer survivor and I just ran my first 10K at 59. If I can do this anyone can. Keep your body in great shape, keep moving and don’t stop. You will feel fantastic! We had a great time at the after-party, just getting to know everyone better. Find a group where you can feel like you belong. They are out there. Just keep looking until you find your group, your crew and your workout buddies. It’s awesome. I wouldn’t miss my 6am workout. I’m not a morning person but I don’t like missing my workout. The camaraderie is awesome. Someone is always cheering you on — and that’s a great feeling. I just completed a personal challenge for the Wellness 101 50-State Challenge. What’s your personal challenge this summer?